Last Code Retreat I was lucky to co-facilitate the event together with Alexandru Bolboaca from Romania. He wrote a summary of the event in Vienna in his blog, so I will not describe it myself. I rather describe one constraint he introduced. A constraint, also known as an activity, is a challenge during a kata, coding dojo or code retreat designed to help participants think about writing code differently than they would otherwise. I have written about other constraints before, e.g. No naked primitives. The last session of a Code Retreat is usual a free session that is supposed to close a great day and it should be fun. 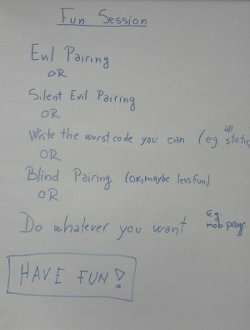 Alex liked to gives participants many options and he came up with a list of different things they could do: While I was familiar with all the pairing games, e.g. Silent Evil Pairing, which is also called Mute with Find the Loophole, I had never tried inverting a constraint. Alex explained that there were many ways to write bad code. All methods could be static, only mutable global state, bad names, too big or too small units (methods, classes), only primitives, only Strings, to just name a few. Some of these bad things are available as their own (inverted) constraints, e.g. all data structures must be hash tables. (PHP I am looking at you ;-) Bad code like this can get out of hand easily, imagine writing the whole Game of Life in a single, huge method. But how could this teach us anything? A regular constraint is an exaggeration of a fundamental rule of clean code or object oriented design. People have to figure out the rule and work hard to meet the constraint. The inverted constraint is similar. People have to think about what they would do, and then do the opposite, exaggerating as much as possible. As a bonus, most of them get stung by the crap they just created a few minutes ago. And most developers really enjoy themselves working like that. Maybe they have too much fun, but I will come back to that later. I used the constraint in several in-house Coding Dojos when the teams asked for fun sessions. Here is what I learned: The constraint is not hard. Some people get creative but in general it is too easy to write bad code. Most "worst" code I saw had inconsistent naming, a lot of duplication, primitives all over the place and bad tests. In general it looked almost like the day to day code these teams deliver. I particularly loved a dialogue I overheard, when one developer wrote some code and proclaimed it as ugly while his pair denied its ugliness. One participant complained that he wanted to learn how to write clean code and that he saw this worst case code everyday anyway. He was really frustrated. (That is why I said not all people like this constraint.) And this is also pointing out a potential problem of inverted constraints in general - practising doing it wrong might not be a good idea after all. I am unable to decide if this constraint is worth using or not. I like the idea of inverted constraints and this one is definitely fun and probably good to use once in a while. 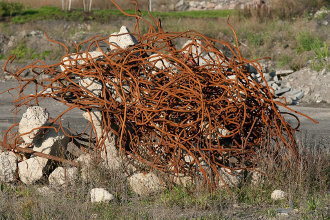 But I believe the constraint is lacking focus and is therefore too easy to meet. People should not deliver code during a practise session that just looks like their production code. I want them to work harder ;-) I will try more focused, inverted constraints next. Allowing only static methods might be a good start. On the other hand, code created when following the constraint to only use Strings as data structures is too close to the regular (bad) code I see every day. Therefore a good inverted constraint would be one that takes a single, bad coding style to the extreme. Allowing only one character for names comes to my mind, which is an exaggeration of bad naming - or even a missing tool constraint, because it renders naming non-existing. Have you worked with inverted constraints? If so, please share your constraints and opinions about them in the comments below.